Looking for unequalled and professional movers and packers in Ashburn, VA for your home or business ? We are the only company to call. Our pro movers can help make your move easier and free of stress. We offer local and long distance moving as well as storage & packing services, making us your all-inclusive moving service choice! Give us a call or email us today for more details about our many services, prices, and any promotional offers. Why Do Ashburn, VA Residents Choose Craig Van Lines? Affordable, Dependable, Local Movers who are licensed, bonded & insured. We have gained the trust and appreciation of local families and small business owners for over 80 years. Our highly competitive rates are determined by the amount of time it takes to complete your move, the number of movers needed, and the drive-time to get to your home to start the process, and to return again after a job well done. Please note that elevators, stairs, and long walks to and from the truck add to the final cost. When you contact us, this will all be clearly explained with the next step being the provision of an accurate estimate for your review. If you are looking for ways to save, moving during mid-week and/or the mid-month periods is generally the least costly way as the demand for our services tends to be lower. If you are planning a big (or not so big) move out of the Ashburn area, we are here to help! Our Ashburn pro movers are also expert in packing so you can be assured that our caring experts are in good charge of your personal items and that all will be secure and safe while in transit to your new location, whether it is across town, the state, or the entire country. Rely on us for packing, moving, and storage no matter your starting point or destination. 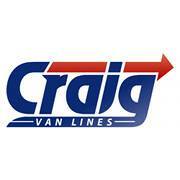 Let Craig Van Lines worry about your items so you don’t have to. Call us for more info and a free moving quote! As moving day looms, your stress levels can easily become a challenge. Relax, we can help ensure that you have everything else you might need, such as packing. This includes everything from wardrobe boxes to custom-built crates. Wardrobe boxes, which have built-in metal rods for hanging your garments, conveniently provide access, transport, and protection for your clothing. These “portable closets” are available for rent on the day of your move for a nominal charge. We also offer a wide variety of other packing supplies, from small, medium, and large boxes to custom made containers for items like flat screen televisions, art pieces, appliances, lighting fixtures, and so much more. If you’re planning on being out of town for an extended period and need a place to store some of your belongings for a while, or if you just want to avoid being seen as a “hoarder” and wish to clear out all that stuff in your back room, we are the solution for you. We have a secure, temperature-controlled location where your items will be kept safe-guarded until your say-so. Need more space than what we might have available? We’ll happily set you up in one of many local Ashburn storage facilities such as those at 44690 Waxpool Road, Ashburn, VA 20147, 45050 Russell Branch Parkway, Ashburn, VA 20147, 20435 Richfield Way Ashburn, VA 20147, 19877 Belmont Ridge Rd, Ashburn, VA 20147 and more! Whatever your storage needs might be, you can count on us to deliver with a solution at a reasonable price. We’ll do the hard work for you, including all the loading and unloading of your items, and when you’re ready to have your items back we’ll deliver them to wherever you desire. Call us today to learn more about our many storage service options. Let us make your life easier! I Would Hire Them Again in a Heartbeat! Craig Van Lines did a great job, I would definitely hire them again. We had a complex move and they were able to handle all the complications. It wasn’t just household things since we also own a small business, so they did the move in a two step process and we also had some items from a deceased family member in Kentucky that were mailed to us. We hired them again after the move to deliver some furniture to our home and that went well too. -Virginia A. Leesburg, VA. Affordable and Accommodating! Craig Van Lines was absolutely wonderful! We’ve used them twice, already, and will absolutely be using them for all future moves. They better not go out of business, ever, because they’re phenomenal and I want to use them every time I move for the rest of forever. They’ve always been impressively affordable, and absolutely outstanding in their customer service. – Sue F. Falls Church, VA. The Gold Standard. Having moved so many times that I can’t count them any more while in government service and now after selling our home, building a new one and moving into and out of a rental, I have to say that Craig Van Lines is the gold standard as far as moving companies go. They are exceptional in every way: estimating; packing; and moving. Their staff is the most professional, courteous and careful with our HHE as well as the house we moved into and then out of. Beyond that, they are super-accommodating – as when a family emergency required that we unload, on same-day notice, half a trailer of HHE to find and retrieve an essential document, and then reload. Very Helpful and Pleasant. I was pretty satisfied with my experience with Craig Van Lines. They were very helpful and pleasant. I don’t have anything bad to say at all. I’m pretty sure I would use them again if I need to. The pricing was a litter higher than what I was expecting, but it’s done and I don’t have any complaints. If you reside in or are moving to Lansdowne, Ashburn Farm, Ashburn Village, Belmont Country Club, Belmont Greene, Broadlands, Brambleton, Farmwell Hunt, Loudoun Valley Estates, in the zips of 20146, 20147, 20148, 20149, you can trust us for our professional moving and packing services. Call us today by phone (703) 273-8852 or email us to learn more about our complete moving solutions! We appreciate that you have considered us for your move to or from Ashburn, Virginia. Craig is a local, family-owned and operated moving company and we’re a proud member of the Better Business Bureau. Exceptional Service - Job Well Done! We got estimates from several movers and Craig was reasonably priced. They took care of moving our stuff to storage and brought our stuff to our new home 4 months later. During both moves, movers arrived early and were professionals. All our items were tagged for inventory. Our floors were covered and we didn't notice any damage to our walls. They took care of disassembling and putting all our furniture back together. I would recommend Craig to family and friends!